For 38 years, the people of Derry have been fighting for such an admission. Ever since 14 civilians were massacred by the British Paratroop Regiment in the city in 1972, the families of dead, the injured and the survivors have been fighting for the British government to acknowledge the truth. The truth being that the British government attempted to crush peaceful civil rights demonstrations by an act of terrorism and mass murder. Despite the pain and death inflicted by its army on January 31 1972, the British government failed on two counts. Not only did it abjectly failed to crush the struggle for civil rights, democracy and freedom in Ireland, it also failed to make its version of what happened on Bloody Sunday stick. 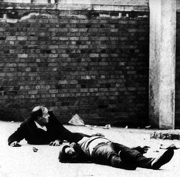 The truth that Bloody Sunday was a massacre is known around the world, to the detriment of the British government’s reputation. What remains to be achieved is the publication of the findings of the Saville Inquiry, which was set up by the British government in 1998. The families deserve at least the semblance of closure that an accurate finding by the Inquiry will bring. But the brutal truth that the British army taught the people of Ireland on January 31 1972 remains - without national rights there can be no civil rights. Until national independence and unity is achieved the British government will continued to abuse the civil and human rights of Irish citizens and it will attempt to crush any resistance to those abuses. These are the reasons that people should mobilise to Derry on January 31; for 38 years, nationalist Ireland has been marching in defiance of the British government and its armed forces in that city and this year should be no different. This month, get to Derry and march in memory of Jackie Duddy, Patrick Doherty, Bernard McGuigan, Hugh Gilmour, Kevin McElhinney, Michael Kelly, John Young, William Nash, Michael McDaid, James Wray, Gerald Donaghy, Gerald McKinney, William McKinney and John Johnston. Get to Derry and march in support of their families and the survivors. Get to Derry and demand national independence. The programme of the annual Bloody Sunday commemoration will include film screenings, discussions, workshops and lectures and will culminate, as always, with the Bloody Sunday commemoration march to mark the 38th anniversary of the massacre. The week of events begins on Monday with a screening of the film, ‘The US vs. John Lennon’ in the Nerve Centre, Magazine Street, at 8pm. The documentary focuses on the Nixon administration’s surveillance of the former Beatle due to his anti-war activities. Tuesday will see a screening of ‘Five Minutes of Heaven,’ a film starring Liam Neeson and James Nesbitt, telling the story of a meeting between the son of a victim of the Troubles and the former UVF man who killed his brother. On Wednesday, the Nerve Centre will host a screening of ‘Not in Our Name,’ which tells the story of the ‘Raytheon 9’ and their subsequent trial. The film will begin at 8pm and admission is #2. The film will be followed by the Bloody Sunday memorial quiz which will be held in the Beechtree Bar, Beechwood Avenue, at 10pm. Admission is #10 per team of five. On Thursday The Pat Finucane Centre will hold a ‘Raiders of the Lost Archives’ event in Culturlann Ui Chanain, Great James’ Street at 7.30pm which will take a look back through historical files, including state papers. Friday afternoon will see a screening of ‘Justice Denied - Voices from Guantanamo’ which will be followed by a discussion involving Moazzam Begg, who was held in the infamous detention camp for five years. The event will begin at 1pm and admission is free. The annual Bloody Sunday lecture will take place on Friday night and this year will involve members of the Bloody Sunday families providing an update on when they expect Lord Saville’s report into the 1972 shootings to be published. The lecture will take place in Culturlann Ui Chanain at 7.30pm. Saturday’s events will include the Irish premiere of a previously lost film on a massacre of up to 3200 Algerians in Paris in October 1961 which will be screened in An Chulturlann at 10am. This will be followed by a training workshop on non-violent action for social justice in Pilot’s Row. Afterwards a panel discussion will take place in An Chulturlann on how states attempt to cover up violent actions. A minute’s silence will be held at the Bloody Sunday monument on Rossville Steet to mark the anniversary of the shootings at 4pm. A fundraising event involving a host of local musicians will held in the performance area of An Chulturlann at 7.30pm and admission is #5. Sunday morning will begin with a wreath laying and prayer service at the Rossville Street monument at 11am with the commemoration march starting at Creggan Shops at 2.30pm going to William Street.